Jemini MDF Edge Beech Top Class Table With Black Frame 1100x550x590mm (Pack of 4) KF74550 Pack of 1 MDF edged classroom table with rounded corners and bevelled edges for added safety. Laminated on both sides for durability. Lacquered finish. Crush bend construction. Dimensions: W1100 x D550 x H590mm. Colour: Beech with black frame. Pack of 4 tables. Jemini MDF Edge Beech Top Class Table With Black Frame 1200x600x590mm (Pack of 4) KF74551 Pack of 1 MDF edged classroom table with rounded corners and bevelled edges for added safety. Laminated on both sides for durability. Lacquered finish. Crush bend construction. Dimensions: W1200 x D600 x H590mm. Colour: Beech with black frame. Pack of 4 tables. Jemini MDF Edge Beech Top Class Table With Black Frame 1100x550x710mm (Pack of 4) KF74552 Pack of 1 MDF edged classroom table with rounded corners and bevelled edges for added safety. Laminated on both sides for durability. Lacquered finish. Crush bend construction. Dimensions: W1100 x D550 x H710mm. Colour: Beech with black frame. Pack of 4 tables. Jemini MDF Edge Beech Top Class Table With Black Frame 1200x600x710mm (Pack of 4) KF74553 Pack of 1 MDF edged classroom table with rounded corners and bevelled edges for added safety. Laminated on both sides for durability. Lacquered finish. Crush bend construction. Dimensions: W1200 x D600 x H710mm. Colour: Beech with black frame. Pack of 4 tables. Jemini MDF Edge Beech Top Class Table With Black Frame 1100x550x760mm (Pack of 4) KF74554 Pack of 1 MDF edged classroom table with rounded corners and bevelled edges for added safety. Laminated on both sides for durability. Lacquered finish. Crush bend construction. Dimensions: W1100 x D550 x H760mm. Colour: Beech with black frame. Pack of 4 tables. Jemini MDF Edge Beech Top Class Table With Black Frame 1200x600x760mm (Pack of 4) KF74555 Pack of 1 MDF edged classroom table with rounded corners and bevelled edges for added safety. Laminated on both sides for durability. Lacquered finish. Crush bend construction. Dimensions: W1200 x D600 x H760mm. Colour: Beech with black frame. Pack of 4 tables. Jemini MDF Edge Beech Top Class Table With Silver Frame 1100x550x590mm (Pack of 4) KF74556 Pack of 1 MDF edged classroom table with rounded corners and bevelled edges for added safety. Laminated on both sides for durability. Lacquered finish. Crush bend construction. Dimensions: W1100 x D550 x H590mm. Colour: Beech with silver frame. Pack of 4 tables. Jemini MDF Edge Beech Top Class Table With Silver Frame 1200x600x590mm (Pack of 4) KF74557 Pack of 1 MDF edged classroom table with rounded corners and bevelled edges for added safety. Laminated on both sides for durability. Lacquered finish. Crush bend construction. Dimensions: W1200 x D600 x H590mm. Colour: Beech with silver frame. Pack of 4 tables. Jemini MDF Edge Beech Top Class Table With Silver Frame 1100x550x710mm (Pack of 4) KF74558 Pack of 1 MDF edged classroom table with rounded corners and bevelled edges for added safety. Laminated on both sides for durability. Lacquered finish. Crush bend construction. Dimensions: W1100 x D550 x H710mm. Colour: Beech with silver frame. Pack of 4 tables. 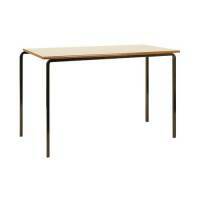 Jemini MDF Edge Beech Top Class Table With Silver Frame 1200x600x710mm (Pack of 4) KF74559 Pack of 1 MDF edged classroom table with rounded corners and bevelled edges for added safety. Laminated on both sides for durability. Lacquered finish. Crush bend construction. Dimensions: W1200 x D600 x H710mm. Colour: Beech with silver frame. Pack of 4 tables. Jemini MDF Edge Beech Top Class Table With Silver Frame 1100x550x760mm (Pack of 4) KF74560 Pack of 1 MDF edged classroom table with rounded corners and bevelled edges for added safety. Laminated on both sides for durability. Lacquered finish. Crush bend construction. W1100 x D550 x H760mm. Beech with silver frame. Pack of 4 tables. Jemini MDF Edge Beech Top Class Table With Silver Frame 1200x600x760mm (Pack of 4) KF74561 Pack of 1 MDF edged classroom table with rounded corners and bevelled edges for added safety. Laminated on both sides for durability. Lacquered finish. Crush bend construction. W1200 x D600 x H760mm. Beech with silver frame. Pack of 4 tables. Jemini PU Edge Beech Top 1100x550x590mm Class Table With Black Frame (Pack of 4) KF74562 Pack of 1 PU edged classroom table with rounded corners and bevelled edges for added safety. Laminated on both sides for durability. Lacquered finish. Crush bend construction. Dimensions: W1100 x D550 x H590mm. Colour: Beech with black frame. Pack of 4 tables. Jemini PU Edge Beech Top 1200x600x590mm Class Table With Black Frame (Pack of 4) KF74563 Pack of 1 PU edged classroom table with rounded corners and bevelled edges for added safety. Laminated on both sides for durability. Lacquered finish. Crush bend construction. Dimensions: W1200 x D600 x H590mm. Colour: Beech with black frame. Pack of 4 tables. Jemini PU Edge Beech Top 1100x550x710mm Class Table With Black Frame (Pack of 4) KF74564 Pack of 1 PU edged classroom table with rounded corners and bevelled edges for added safety. Laminated on both sides for durability. Lacquered finish. Crush bend construction. Dimensions: W1100 x D550 x H710mm. Colour: Beech with black frame. Pack of 4 tables. Jemini PU Edge Beech Top 1200x600x710mm Class Table With Black Frame (Pack of 4) KF74565 Pack of 1 PU edged classroom table with rounded corners and bevelled edges for added safety. Laminated on both sides for durability. Lacquered finish. Crush bend construction. Dimensions: W1200 x D600 x H710mm. Colour: Beech with black frame. Pack of 4 tables. Jemini PU Edge Beech Top 1100x550x760mm Class Table With Black Frame (Pack of 4) KF74566 Pack of 1 PU edged classroom table with rounded corners and bevelled edges for added safety. Laminated on both sides for durability. Lacquered finish. Crush bend construction. Dimensions: W1100 x D550 x H760mm. Colour: Beech with black frame. Pack of 4 tables. Jemini PU Edge Beech Top 1200x600x760mm Class Table With Black Frame (Pack of 4) KF74567 Pack of 1 PU edged classroom table with rounded corners and bevelled edges for added safety. Laminated on both sides for durability. Lacquered finish. Crush bend construction. Dimensions: W1200 x D600 x H760mm. Colour: Beech with black frame. Pack of 4 tables. Jemini PU Edge Beech Top 1100x550x590mm Class Table With Silver Frame (Pack of 4) KF74568 Pack of 1 PU edged classroom table with rounded corners and bevelled edges for added safety. Laminated on both sides for durability. Lacquered finish. Crush bend construction. W1100 x D550 x H590mm. Beech with silver frame. Pack of 4 tables. Jemini PU Edge Beech Top 1200x600x590mm Class Table With Silver Frame (Pack of 4) KF74569 Pack of 1 PU edged classroom table with rounded corners and bevelled edges for added safety. Laminated on both sides for durability. Lacquered finish. Crush bend construction. W1200 x D600 x H590mm. Beech with silver frame. Pack of 4 tables. Jemini PU Edge Beech Top 1100x550x710mm Class Table With Silver Frame (Pack of 4) KF74570 Pack of 1 PU edged classroom table with rounded corners and bevelled edges for added safety. Laminated on both sides for durability. Lacquered finish. Crush bend construction. W1100 x D550 x H710mm. Beech with silver frame. Pack of 4 tables. Jemini PU Edge Beech Top 1200x600x710mm Class Table With Silver Frame (Pack of 4) KF74571 Pack of 1 PU edged classroom table with rounded corners and bevelled edges for added safety. Laminated on both sides for durability. Lacquered finish. Crush bend construction. W1200 x D600 x H710mm. Beech with silver frame. Pack of 4 tables. Jemini PU Edge Beech Top 1100x550x760mm Class Table With Silver Frame (Pack of 4) KF74572 Pack of 1 PU edged classroom table with rounded corners and bevelled edges for added safety. Laminated on both sides for durability. Lacquered finish. Crush bend construction. W1100 x D550 x H760mm. Beech with silver frame. Pack of 4 tables. Jemini PU Edge Beech Top 1200x600x760mm Class Table With Silver Frame (Pack of 4) KF74573 Pack of 1 PU edged classroom table with rounded corners and bevelled edges for added safety. Laminated on both sides for durability. Lacquered finish. Crush bend construction. W1200 x D600 x H760mm. Beech with silver frame. Pack of 4 tables.